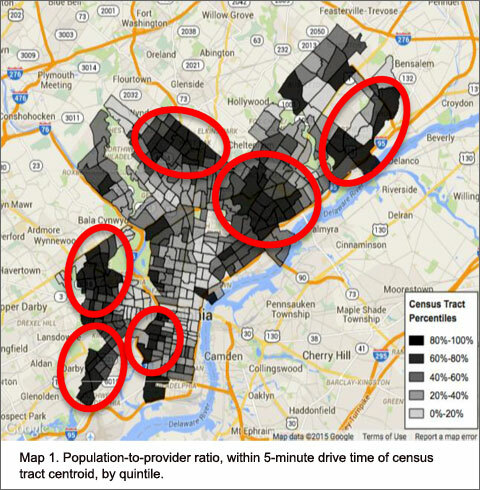 Depending on your neighborhood in Philadelphia, you may face a 10-fold difference in the supply of primary care practices located close to your home. This is the finding of a new study commissioned by the Philadelphia Department of Public Health and conducted by a research team that I headed. The study is the first of its kind to look at primary care supply in a major urban center at a very granular level. Its results suggest that even in a generally well-supplied primary care system, there is a need to consider and monitor disparities across neighborhoods. The increase in the insured population through the Affordable Care Act (ACA) means that more people should be able to access primary care. Primary care has been shown to have a big impact on population health and can improve overall health outcomes. Monitoring access to primary care is an essential public health function, and yet few if any local health departments have the data or capacity to do so. That’s where our study comes in. We had two important goals: first, to provide a snapshot of the current geographic supply of primary care providers, and second, to create a replicable surveillance tool for the Philadelphia Department of Public Health to use in the future. With funding from the Independence Foundation, our research team, which includes Penn researchers David Grande, Daniel Polsky and Jane Seymour, as well as Corentin Barbu, formerly at Penn but now at the Institut National de la Recherche Agronomique (INRA) in France, looked at where people live in relationship to where the primary care providers are, assessing availability within a five or eight-minute drive time. We also looked specifically at the supply of providers serving the Medicaid population, particularly important now that Pennsylvania has expanded Medicaid coverage under the ACA. We compiled a database of likely primary care providers from a variety of sources, including a proprietary marketing database and lists from public and private insurers. We verified the location and number of providers through a phone survey, ultimately identifying 460 primary care locations in the city. We then calculated population-to-provider ratios by census tract (a good proxy for neighborhood). Our analysis shows an approximate 10-fold difference in primary care supply between the highest- and lowest-served areas of the city. We identified six clusters of lowest access: Southwest, West, Northwest, Lower Northeast, Greater Northeast, and South Philadelphia/Gray’s Ferry. We consider these to be areas at risk for insufficient primary care. But the ideal response to this disparity is not clear. Although opening new primary care locations in these less served areas is the seemingly obvious answer, it may not be the right one. We looked at where people live in relationship to where the primary care practices are; there are many other factors that play an important role in determining whether people have adequate access to primary care, and we couldn’t explore them all in this study. Here are some questions that the study raises, ones that we hope to answer as we continue this work. Where do people want to get care? We assumed that people seek primary care near their homes. In reality, people may not choose the care that is geographically closest. They may prefer an office near their work, keep seeing a provider near where they used to live, or only consider clinics that they can get to easily via public transportation. Claims data would shed light on these utilization patterns, by linking patients’ home address to the address where they actually receive care. Although Pennsylvania has an all-payer claims database for inpatient and emergency room visits, there is no multi-payer source of information on outpatient claims. Such a resource could be useful for answering a variety of questions about primary care adequacy. Patients may have additional preferences or constraints on where they get primary care, such as insurance network limitations. Surveys of potential patients could capture these non-geographic considerations. One existing mechanism is the Public Health Management Corporation (PHMC) Household Health Survey, perhaps with a focus on oversampling people from the low-access areas of the city that we identified. Can people get care when they need it? Just because a facility exists, the care is not necessarily available to patients who need it. In Philadelphia, this has been widely recognized as a problem in the context of Health Center 10, which is located in the lower Northeast portion of the city. This facility, run by the Philadelphia Department of Public Health, can have new appointment wait times up to several months. It’s difficult to determine whether an office is accepting new patients, a particular type of insurance, and when the next appointment is available. Answering these questions accurately can be done with audit methodology, also known as the “secret shopper” approach. 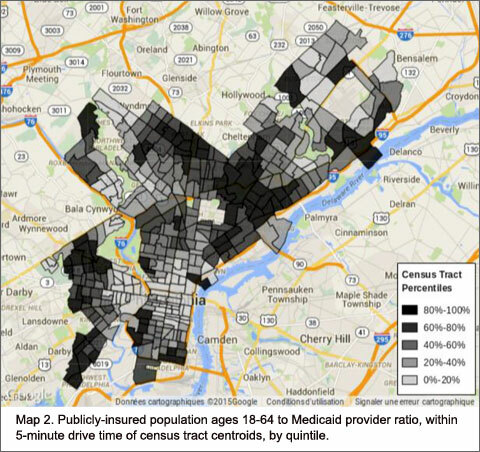 Such a study in the Philadelphia area could shed further light on how insurance status affects the ability to access primary care. How will our findings change over time? Any analysis of primary care supply needs to be revisited regularly. Certain investments in the data infrastructure around primary care could make repeating our work easier in the future. The currently existing primary care provider registries all have limitations, such as inaccurate information, data that is limited to zip code rather than street address, or high cost. The only time in which providers need to officially register with any government body is during the licensure and renewal process. This is a missed opportunity to collect data on our primary care system. By implementing a minimum data set, which has already been proposed by the Health Resources and Services Administration, the state would be gaining a complete set of data on providers that is guaranteed to be updated regularly. Our study suggests that there are potential areas for improvement of primary care supply even in a largely well-supplied system. Continuing surveillance at the neighborhood-level would give local stakeholders the information that they need to make decisions about how to improve primary care in their communities. Our analysis provides a start, but we’ll be trying to answer the many remaining questions and hope that other stakeholders will too. Working together we can get a clearer picture of population access to primary care and begin to address any inadequacies that may exist.